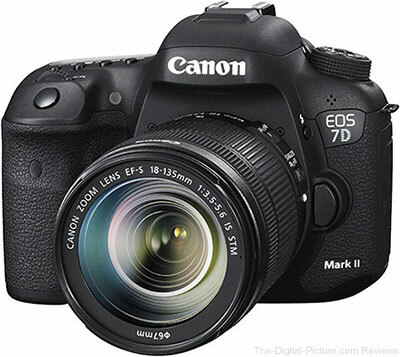 My Canon EOS 7D Mark II arrived this week – WOO HOO! I will have lots of information to share about this camera in the very near future, but I kept notes as I unpacked and configured the "Baby 1D X" to the perfect (for me) setup. Following are the 30 (OK, there were initially 30, but I've tweaked the list slightly) steps I take to make an out-of-the-box 7D II ready for use. Open the box, find the battery and charger and plug it in. If you have another charged battery available, you can continue to the battery-required steps without a wait. While the battery is charging, unpack the other items you want from the box. For me, this is primarily the camera, the neck strap and the Canon Solution Disk. Install Canon Solution Disk software to get support for the latest camera(s). Canon Digital Photo Pro (DPP), EOS Utility, Photostitch and Lens Registration Utility are the options I manually include in the install. Insert the battery (after charging completes). The date and time setup screen will show at startup the first time. Use the Rear Control dial and the Set button to update this information. The GPS feature, if enabled, should take care of precise date/time maintenance going forward. Set the camera's mode to one other than fully auto (the GreenSquare+ mode only provides a small subset of available menu options), C1, C2 or C3 (Custom modes do not retain settings for use in other modes). Shooting Menu, Tab 1: Image quality: Use top dial to set RAW to "RAW" and Rear Control dial to set JPEG to "–"
To copy this configuration would mean that you intend to shoot similar to how I shoot – including shooting in RAW-only format. While my setup works great for me (and Sean's setup is nearly identical), your best use of this list may be for tweaking your own setup. If you can't remember your own menu setup parameters, keeping an update-to-date list such as this is a good idea. Anytime your camera goes in for a service visit, the camera will be returned in a reset-to-factory state. Your list will ensure that you do not miss an important setting while putting the camera back into service. B&H has the Canon EOS 7D Mark II DSLR Camera with EF-S 18-135mm IS STM Lens in stock and I expect the body-only version to be available soon (preorder for earliest delivery).